The kitc hen is for cooking, thanks to which all family members are gaining strength to work for the sake of prosperity. It is, therefore, considered that the wealth of the family depends primarily on the food. A balanced diet is providing a balanced and favorable level of the "Qi" energy in the kitchen, which is beneficially affecting the inhabitants of the house. 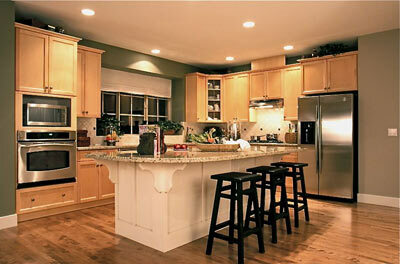 The best places for the kitchen are: the eastern, southeastern and northern parts of the house. The kitchen door has to be opened as freely as possible, so it will leave a free pass for the optimum flow of the "Qi" energy in this important room. Care should be taken so that the door was not touching, for example, the kitchen cupboard or refrigerator. Since the main element of the kitchen is water, and water is associated with wealth, any mess in the kitchen will reflect the chaotic state of the family finances, so it is important that the kitchen was not crowded and the surfaces of tables were not full of various objects. As long as the state of the kitchen is reflecting the state of your finances, then you have every reason to make yourself a promise and clean your kitchen better than ever. We should not forget that the furniture with the sharp corners, open shelves and sharp objects are a the sources of "Sha Qi", and all this must be avoided. If you still have open shelves, then there should better be placed some cups rounded in shape, and the cookbooks in any case shall not be faced towards the person, who prepares the food as it may be detrimental to his health. The kitchen stove must be clearly visible from the door, and the one, who is cooking on it should not feel squeezed from all sides. If these conditions are not met, then this will lead to the lack of smoothness of the "Qi" energy flow. With the help of mirrors and metal plates you can achieve a visible extension of the space, creating in the kitchen a more relaxed atmosphere. Best of all, if the stove and the sink, or the stove and the refrigerator are not beside each other, because related elements of this items are contradicting to one another. Ideally, the sink should not be placed not in the northern part of the kitchen, since the fire is conflicting with water, neither in the north-west. The last is because the symbol of the north-west is the sky, and the position of the fire beside the celestial gates has a negative impact on the welfare of the household head. North, which is ruled by the element of water - is the most suitable place for the sink, although mostly people place their sink for the sake of convenience. The only place, that is absolutely not good for the sink - is south. If the sink can not be established in the northern part of the kitchen, then perhaps there will be a place the for washing machine or a dishwasher, which will also promote professional growth. Both of these devices must operate as quietly as possible - not to cause any turbulence in the flow of the "Qi" energy. Too high levels of noise can have an extremely adverse effects. For example, the noisy equipment in the south-west can destroy family relationships, and in the east it may adversely affect the health of the family members. The kitchen appliances such as refrigerators and microwaves, are working constantly, which means that they can be used effectively to stimulate some certain parts of the kitchen. South-eastern position of the refrigerator, will further improve the financial situation, and the south-western - strengthens the family relationships. Refrigerator should not be installed in the southern part of the kitchen, because the fire is not compatible with the low temperature. Since the microwave can easily be moved to another location, so it can be installed in that part of the kitchen, where the "Yin" energy is in need of revitalization. North-west and west are related to the energy of metal, and if you will set the microwave there, it will lead to the increased influence of this particular element. Smaller electrical appliances such as kettles, blenders and so on, are even more easy to move, so they can be arranged in the different parts of the kitchen in such a way, that they will ensure the most beneficial movement of the "Qi" energy. Their influence will be even more positive if the electric socket, to which they are attached, is located in one of your favorable directions. It should be determined according to the case, the effect of which part of the kitchen is better to strengthen by using the clocks: quiet north or active south. Since the kitchen is designed for the vigorous activity, the situation there should be characterized by the predominant influence of the "Yang" energy. Wood enhances the influence of "Yin" and metal strengthens the influence of "Yang". So you need to find the optimal balance of these two opposing forces, taking into the account all factors. The excess of "Yin" may lead to the sluggish atmosphere in the family, and the excess of "Yang" can make family members unable to respond to the feelings of each other. It is essential that the light in the kitchen will be bright but not harsh. The source of the most beneficial "Qi" energy is the natural light in the kitchen, so it is best to establish a single window without any internal binding. In the daytime the curtains should be as spread apart, as possible and the blinds must be raised. On the windowsill there should be nothing other than a crystal or some plants that enhance the "Qi" energy. In order to achieve a positive impact in a small, dark kitchen, you should paint the walls with the light color and provide the necessary lighting. Colors of the kitchen can be pretty juicy, and when they are selected, you may need to rely on the positive cycle of the elements, to strengthen the "Qi" energy to the maximum extent. In the kitchen it is best to keep herbs, that are used in cooking. They will certainly activate the kitchen in places of their location, and also, when added to the food, will provide people with the spiritual support. If the kitchen is also at the same time the dining room, it should be possible to distinguish between the areas for cooking and eating, or each room will lack some properties of the "Qi" energy. It is best to put some kind of a wall between the two premises, for the flows of the "Qi" energy in this rooms were independent from each other. If it is not possible, you can separate two parts by using a screen or some barrier, and at the points of a contact between two flows of the "Qi" energy, you can place two plants. Since the dining table is the most important point of the dining room, it should not be used as a wall.